It was the full moon and I had a looong week at school with lots of meetings. Those of you teachers out there can infer what kind of tired I am. Those of you who read this and aren't teachers can't understand because you don't have the schema the teachers do. I taught a wonderful set of lessons on inferring. Thank goodness for the internet, because I would never have come up with all of this on my own! 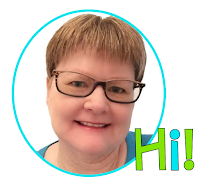 First, I used this great free PowerPoint from the fabulous Emily Kissner. Go check out her blog (after you finish reading this!) for her many wonderful ideas and resources. Then I introduced the idea of CSI. My kids know all about the tv show. They could tell me that the investigators in the show look for clues and make inferences. Then I showed them the CSI poster I made, and they all created one in their reader's notebooks. Here's what that poster looks like. The following day, I used Classroom Magic's fabulous idea on using commercials to infer. This lesson was so engaging to the students! They loved watching the commercials! 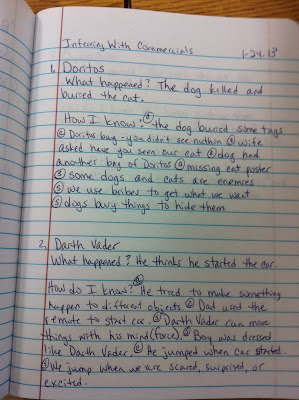 After we watched (we started with the Doritos/missing cat commercial), we recorded our ideas in our reader's notebooks. First we wrote the question, "What happened?" Together we formulated an answer. Then we wrote down the question, "How do I know?" Then the magic happened. Students shared clues from the commercial. We wrote them down and coded them with a c. They noticed everything! 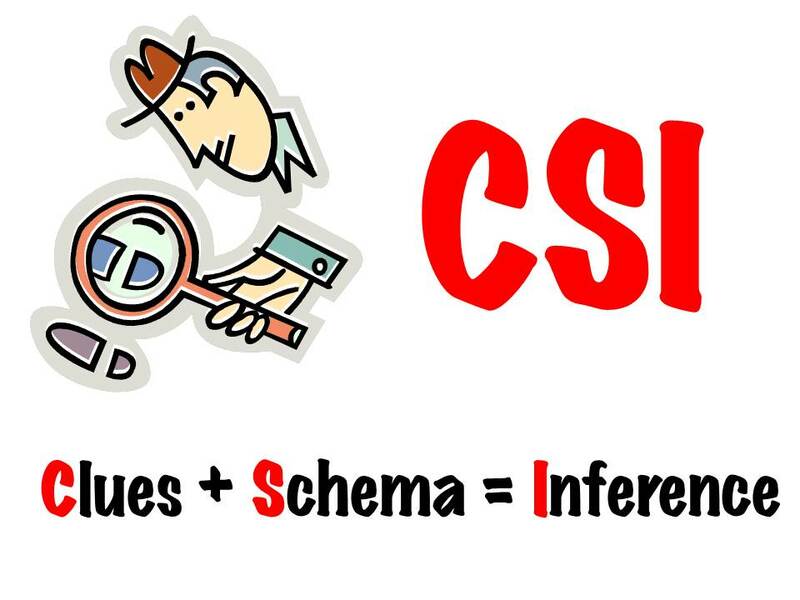 Then we talked about our schema, and what helped us understand the clues so that we could make an inference. I thought that would take a lot of prodding, but it didn't. The kids really got it. When we wrote down those ideas, we coded them with an s.
Then we did the same thing using the Volkswagen/Darth Vader kid commercial. This time, I asked the students to work with a partner to talk about and record clues and schema. After they had some time to work, I called them back together and we shared what we had written. I was so impressed by the work the kids did. They really enjoyed the activity and begged to do it again the next day, even my tough kid who hates everything we do. Of course, I agreed. The next day, we used the happy grad commercial and a commercial I love that is not part of Classroom Magic's links. Here is the link to the Budweiser Clydesdale's commercial. I know, beer. But the commercial is not overtly selling beer, and the message of the commercial is great. The kids were rock stars in coming up with clues and schema. 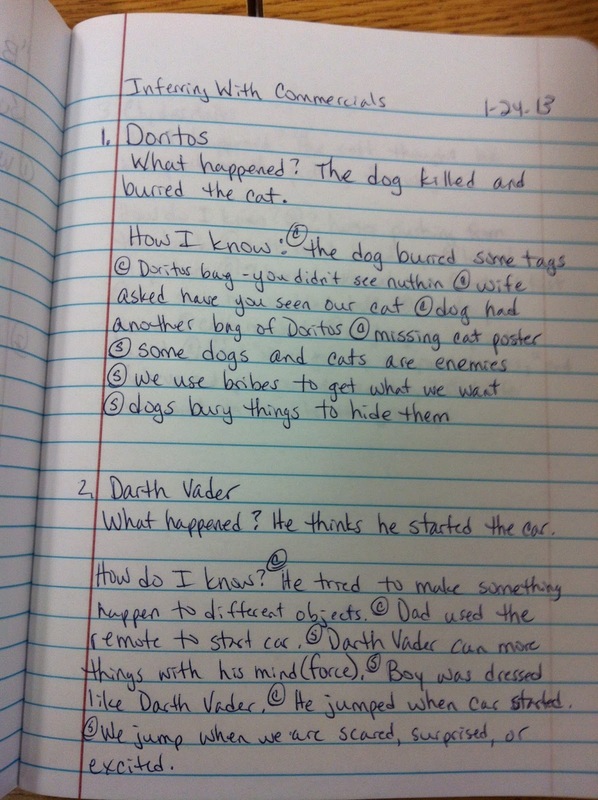 Here is a picture of my notes - I keep a notebook and write in it along with the kids. Didn't they have great thinking? And, as one student noted, we wrote so much! Next up: the amazing Chris Van Allsburg unit by Runde's Room. Love this! Awesome ideas....thanks for sharing! Thanks for the ideas Suzanne. You are a rock star yourself. Thanks again for sharing.